FEEL RIGHT AT HOME with a cup of coffee while relaxing on the 3rd floor in a desirable condo in The Preserve at Oakleaf. Move-in ready. Immaculately maintained. Features: Single Car Garage + additional dedicated parking space, Fully Functioning Elevator, Ring Doorbell, and App Controlled Thermostat. 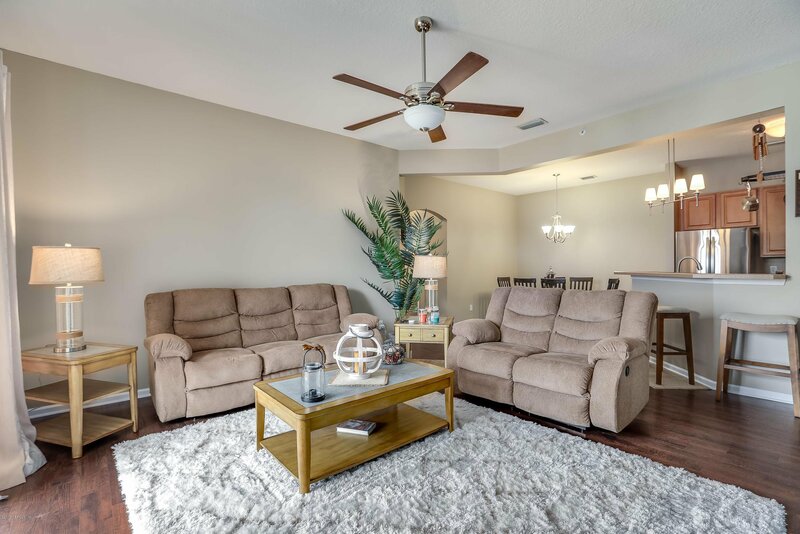 This spaciously beautiful 3/2 condo has lots of natural light, a large kitchen with all new stainless steel LG appliances, a brand new washer & dryer, new air condenser, freshly painted interior, separate dining room and living room with a private balcony. Wood flooring throughout, with neutral tile flooring in wet areas. Access to all amenities such as tennis courts, fitness center, soccer fields, pools, Water Park, walking trails, basketball courts, and more. A+ Schools. Located close to Hospitals, NAS Jax Military Base, Cecil Field, shopping and restaurants. Easy access to all major highways, I-295, I-95, I-10 and to Downtown. Listing courtesy of BERKSHIRE HATHAWAY HOMESERVICES FLORIDA NETWORK REALTY. Selling Office: HEWITT REALTY LLC.